The Moon's shadow swept up the valley at twice the speed of sound turning day into night. It was now time to turn around and look at the eclipsed Sun. We began our journey in Iceland. Our flight to the USA allowed us a few days stopover in the land of fire and ice. We explored Reykjavik with its galleries, museums and pretty houses set around a lake. We managed to see a Minke whale on a boat trip in rough seas and cold rain. Thingvellir was where the ancient parliament was based. Two tectonic plates (the America and Eurasian) meet here and you can walk between them. 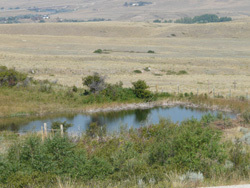 The whole area is set by a beautiful lake and there are waterfalls. The landscape in the region was dramatic and the changing light made it ever more so. At Geysir, we saw water gushing out of the ground in the place which gave the phenomenon its name. We arrived in the USA at the cosmopolitan city of Denver where the Art Museum features indigenous art and culture. We ordered our first breakfast eggs in US English but I found the bacon came out "over crispy". The house of Titanic survivor, Molly Brown, was interesting. Boulder was more Bohemian and had a Tadjik tea house as well as the Mork and Mindy House. We hired a car (a bit scary at first on the "other side of the road") and bought the $80 pass for national parks valid for a year. Our first was Rocky Mountains NP. Here we saw chipmunks, blue jays and elk. In Cheyenne we saw lots of "cowboy" fashions. We visited the Union Pacific Railway Museum and a Wild West heritage site. 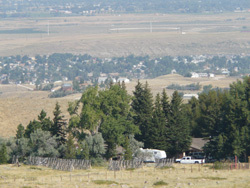 Laramie saw us visit a prison that held Butch Cassidy. By the time we got to Casper I had driven more than in the previous year in London. We had booked our hotel three years earlier and had got it for $99 plus tax per night. The people were very welcoming and excited about the eclipse. They had made it into a long weekend with parties, music and educational events. I gave an eclipse presentation at Green Acres Camp Site where I was guest speaker. I showed my slides about eclipses on a mobile stage after a pair of Country singers. The back of the stage area was a giant haystack to which someone had pinned white boards for my projected slides. 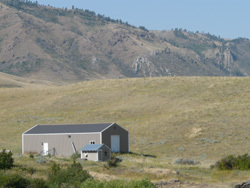 The day before the eclipse I was interviewed by two TV stations, one from the UK (ITV News) and the other from Montana. Talaat and Kryss set off from our hotel at 7:40am. 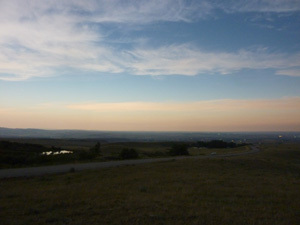 The sky was blue and clear with whisps of high cirrus clouds in the North. 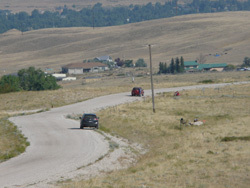 Trafic was light - but in Wyoming two cars together is a traffic jam. 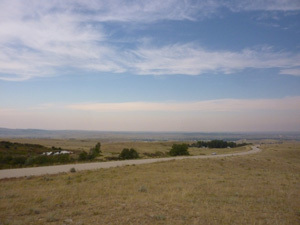 The traffic that did exist was mainly heading into Casper. 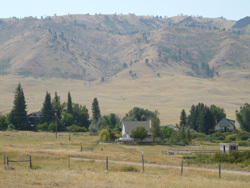 Twenty minutes later we had arrived at a series of small homesteads at the end of dirt road called Fields Creek. 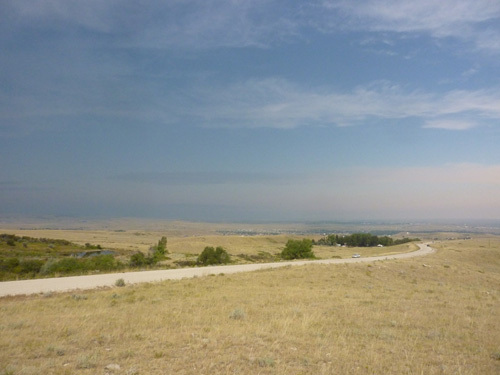 The site had been selected the previous day but had been recommended on FaceBook by Dwain (a local resident for whom I had given my eclipse presentation). He suggested it because it was away from the city centre (no street lights coming on during totality) and the land around the road was public (no chance of trespassing in a country where people have guns). Glyn, from Wales, had been part of the discussion on FaceNook and met us there. 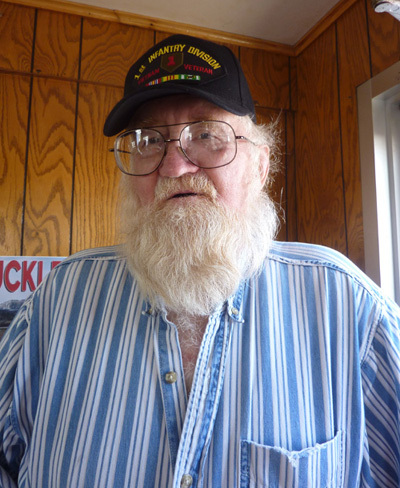 He had "seen" two previous eclipses but had been clouded out. I asked him if he was wearing his lucky shorts! 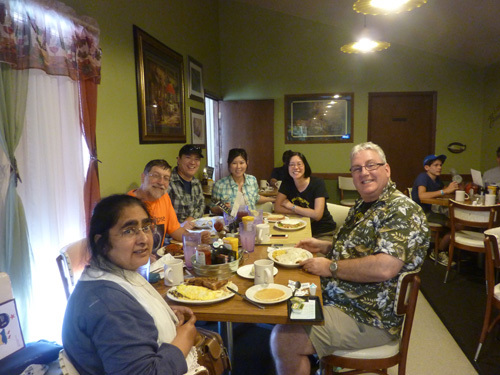 We were joined by friends, Allan and Cindy who had seen the 2012 eclipse in Australia with us and had designed their vacation around this one. They had booked hotels a few months earlier and could not find anything in the path of totality. They had just driven 100 miles (160km) to get to us. Two US cyclists (Ruth and Kevin) arrived and promptly joined us. They were seeing their first total eclipse. Dan and Janet arrived. 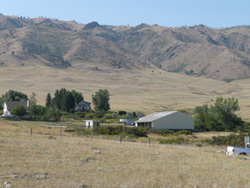 They had seen a few eclipses with us in the past and lived in San Francesco so it was easy for them to get time off and drive from their camp site a short distance away. Our little grouping was completed when we invited a German family who were parked nearby. Harald and Bettina had seen the 1999 eclipse in Germany and wanted to share the experience with their two sons, Benedikt and Felix. First Contact was upon us at 10:22 before we had time to think about it. The thin cloud remained in the North and it was windy. We only begain to notice the effects of the eclipse after 11. Our little group was alone. A few residents passed in their vehicles and waved at us. On a ridge a few hundred metres away we could see a lone tree and two men. 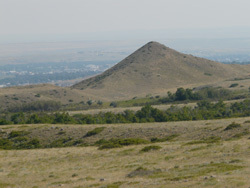 A couple with a dog were walking in the rolling hills. 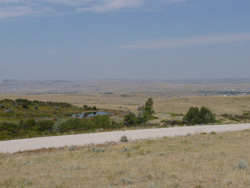 In the distance there were two or three cars parked by the dirt road with small groups of people huddled together. From around 11:30, the sky began to turn a deeper blue making a contrast with the thin high clouds. The Sun's light became more golden. The landscape became more three dimensional as the harsh midday Sun was tamed. Totality was due at 11:42:30. Two minutes before, the Moon's shadow began to appear from the North West. The light levels were falling by the second. I spotted Venus to the right of the Sun and higher. The approach of the Moon's shadow between 11:40 and 11:42. The Moon's shadow swept up the valley at twice the speed of sound turning day into night. The light remaining from the Sun had become silvery. My experience told me it was time to turn around and look at the eclipsed Sun. The silvery light was due to the beautiful diamond ring, caused by the final rays of sunlight shining though a lunar valley before disappearing. 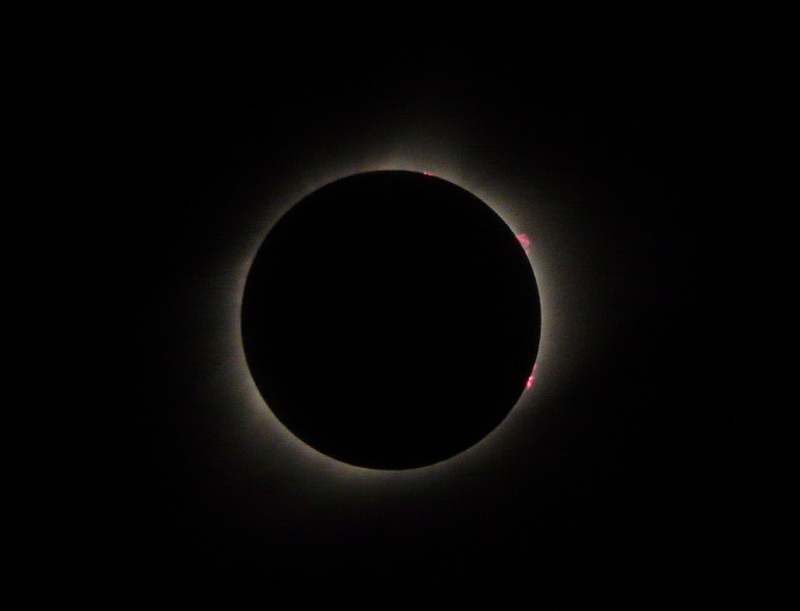 This faded over several seconds leaving the magnificent corona around a black Moon. 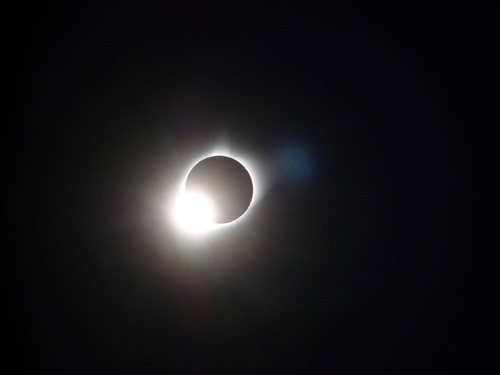 Totality begins with a diamond ring. 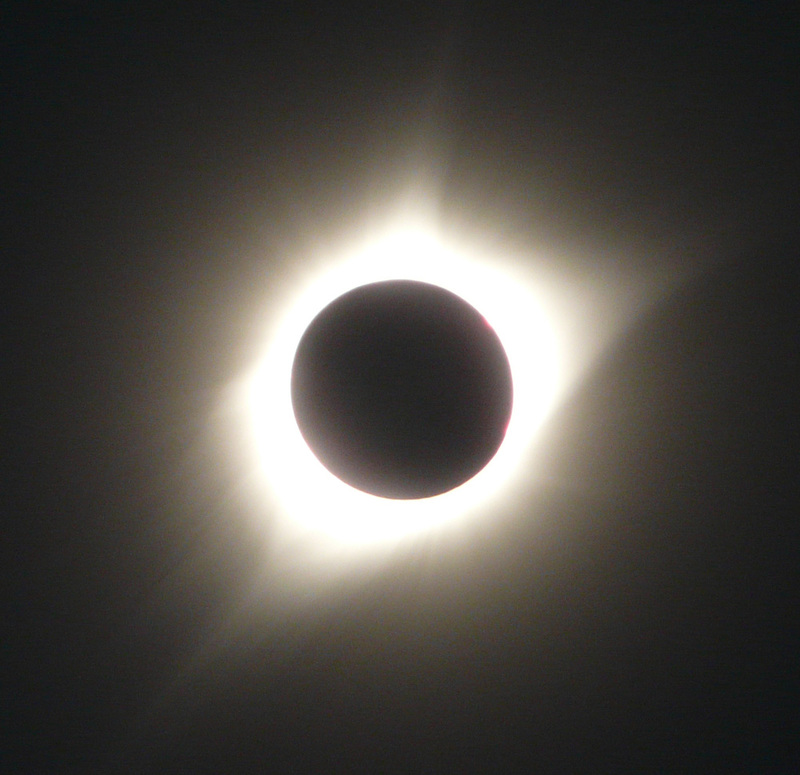 I looked at the corona with the naked eye. There were three sets of streamers, two on one side and one opposite. I looked at the eclipse through binoculars. 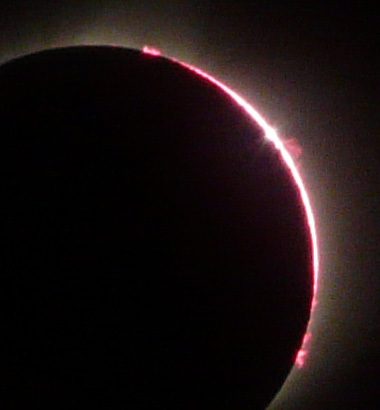 There were prominances on the right; two at first and a third became exposed as the Moon moved across the Sun. The star Regulus (brightest star of Leo) was visible to the left of the Sun just two Moon widths away on the edge of the corona. I could even see its blue colour. Venus glistened pure white to the right of the Sun and I saw the brightest star, Sirius twinkling below it just above a hill. 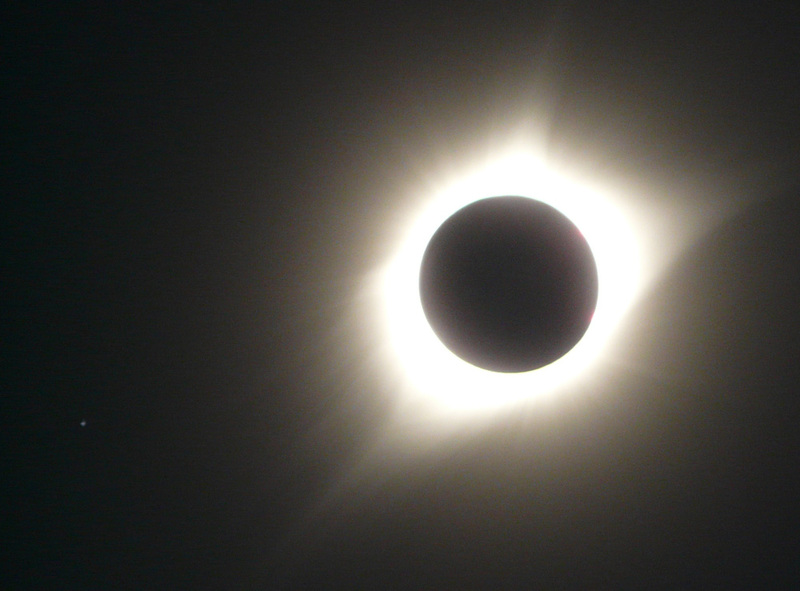 The spectacular corona during Totality. Regulus, the brightest star of Leo is visible to the left of the Sun. 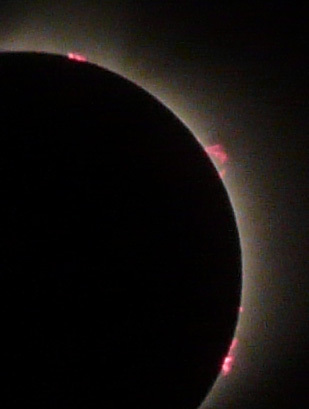 Prominances are becoming exposed as the Moon moves away from them. The sky was as dark as a late twilight. 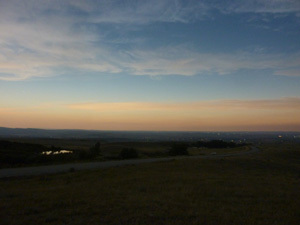 The red of sunset could be seen all around the horizon. In the distance, street lights had come on in the city. A few whispy clouds added to the drama. 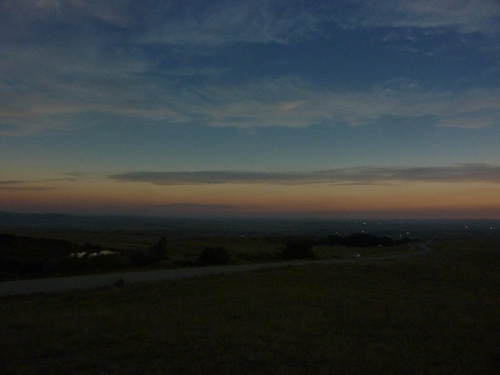 Totality - View of the eclipse over the hills. 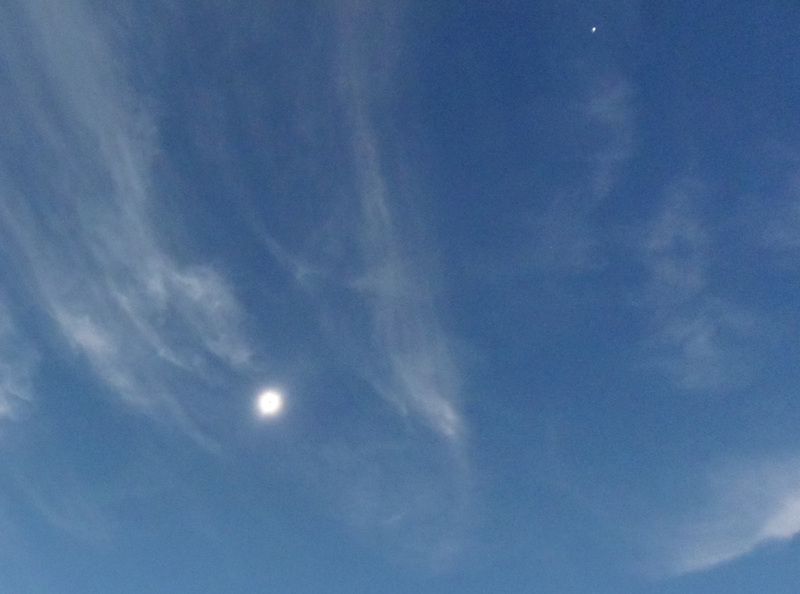 The eclipsed Sun and Venus. The sky brightened from the West. The Sun's chromosphere appeared. This was red. Then a diamond ring burst into view. 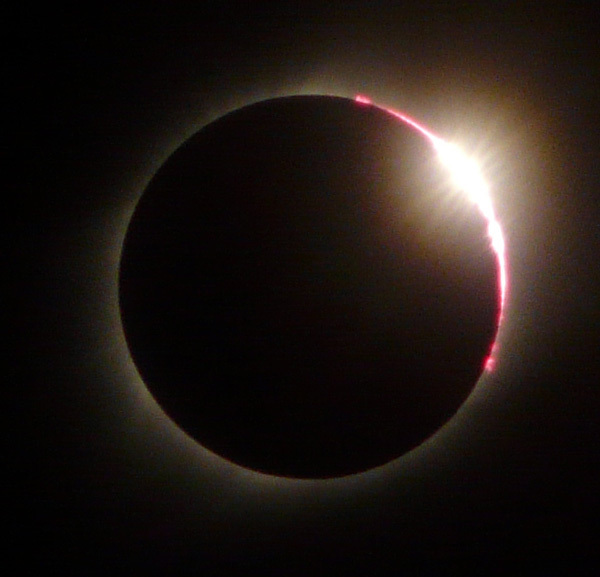 With the silver light of the diamond ring breaking out between the fiery red prominances, it looked like a diamond ring studded with rubies. The landscape lit up. Colour retunred to the scenery. All too quickly the eclipse was over. Venus remained visible for a few minutes. The Moon's shadow departs between 11:43 and 11:44. The chromosphere and the very beginning of the final diamond ring. Bailey's Beads and the final diamond ring marks the end of totality. Everyone was smiling and elated. It had been a successful eclipse. I was pleased that all the planning, looking at maps, making local contacts, the navigation and driving (on the "wrong" side of the road) to get here, the early hotel booking - all these things had paid off. We had seen an excellent eclipse. It reminded me of the 2008 version in Siberia in its swiftness and suddenness. We chatted to the two men who had been by the lone tree. They were Texans who had made the effort to come for the eclipse and had been overwhelmed. Glyn was happy that his third eclipse had been clear. His cameras had misbehaved but he'd seen totality in all its glory. Harald was beaming with pride that his young family had experienced the eclipse. Allan and Cindy were talking about coming to Chile in 2019. Dan located a diner for lunch. We drove in convoy and, after a short wait, sat down for a nice home-made meal in a friendly family-run place. I had my first meatloaf. The chef came out to welcome us and to make sure we had enjoyed the food. Six of us at lunch at G-Ma's Diner with our chef. The Moon's shadow passing over our eclipse site. Back in town, everyone we now talked to understood why so many people had come so far to see totality. They all understood that people who had declared that 98% was enough and they would watch it from just outside the path, had been foolish. 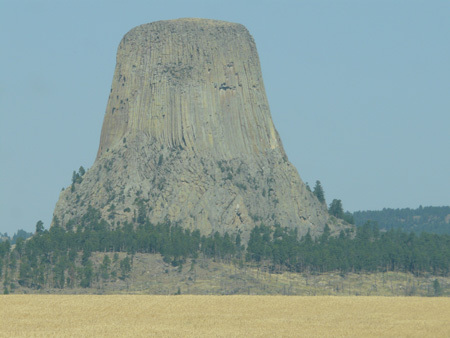 We continued our trip to Devil's Tower and Mount Rushmore before heading West to Cody and the Buffalo Bill Museum. I saw my first (and probably last) rodeo. In Yellowstone National Park I failed to see bears but did see wolves. The Grand Tetons looked superb. A long drive to Utah for Salt Lake City, Dinosaur Monument, Arches National Park and Canyonlands National Park. Mesa Verde National Park was fascinating with its indigenous "Pueblo" cliff dwellings and culture. We rode the Durango to Silverton Railway ("all aboard") then headed to the Navajo Nation for the spectacular Monument Valley. Canyon de Chelly was wide and fertile. We stayed a night at the Hopi Cultural Centre before heading to a corner in Winslow on Route 66. We visited Flagstaff and its observatory via the Meteor Crater. The Grand Canyon was spectacular. Las Vegas was "over the top" but it couldn't be missed. Death Valley was awesome. Great star gazing. I saw Joshua trees. The eponymous trees in Sequoia National Park took our breath away. Yosemite (once I learnt to pronounce it properly) was lovely. We went to Jamestown for another railway journey and the ghost towns of the gold rush era. A week in San Francisco was not enough. A train brought us back to Denver in a blizzard - it was time to go home. Written account and all text descriptions. (© 2017, 2018). All programming, photo and video editing. 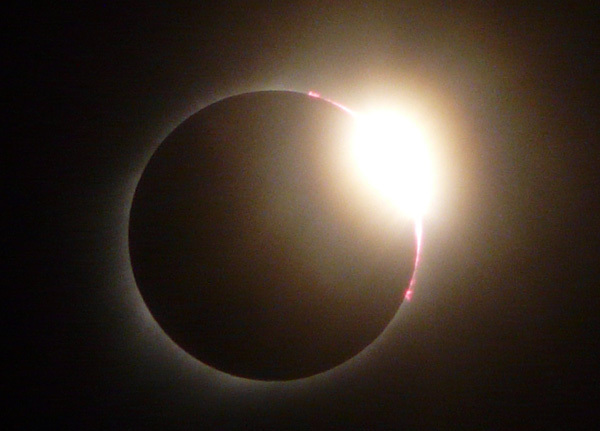 Diamond rings, Totality (corona and prominance), Fields Creek. The approach and departure of the shadow. Accomodation for $99. I booked three years before the eclipse. For a superb home cooked lunch after the eclipse. 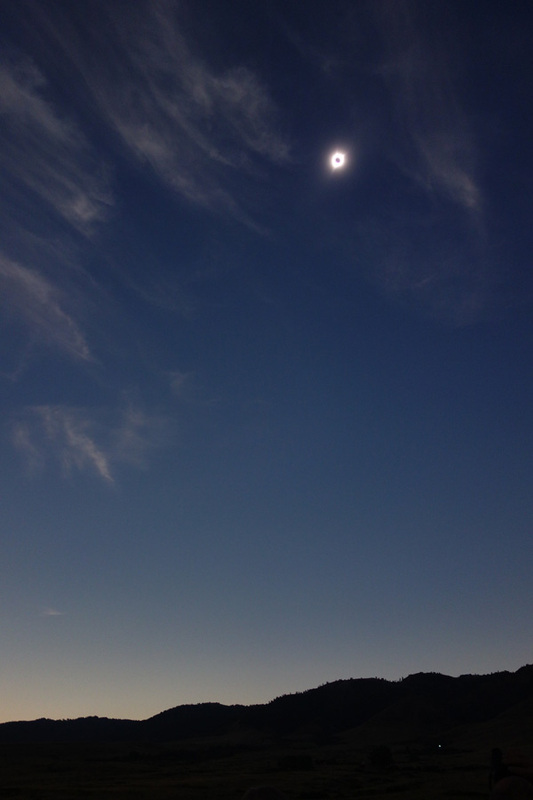 Advice and information that helped selecting the eclipse site. ... $1000 extra charges added by Thrifty onto my credit card without our knowledge after we had paid RentalCars in the UK for everything apart from the one way fee ($500 to take the car from Denver to San Francisco). We managed to get a partial refund from Thrifty after a month of calling RentalCars (who blamed us, the victims) and being told that Thrifty would not deal with us directly. This was the only negative of trip and something I had not experienced before. In Chile 1994 there were no problems with the car hire. In the Faeroe Islands (2015) the rental company offered us a partial refund (without us asking) when we brought the car back a day early and gave me a lift back into town. It turns out to be a known scam at USA airports and is often aimed at tourists. I will never use RentalCars again and will be very wary of hiring a car in the USA again. The 2017 eclipse main page. Maps of the path of the 2017 eclipse from Fred Espenak and eclipse details at the observation site. People from the 2017 eclipse. The partial phases of the 2017 eclipse. 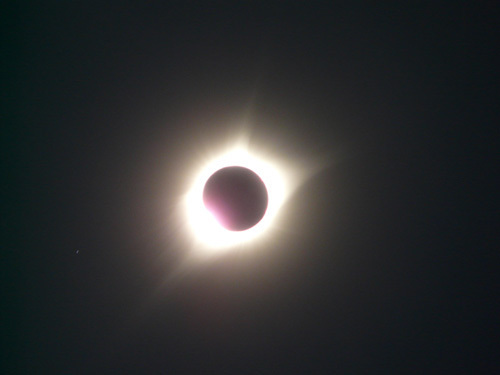 General photos from the 2017 eclipse.